Recent observations show that the long-lived storm on Saturn has been joined by a second one. Both look spot-like in small telescopes but in reality are continent-sized convection phenomena. In other news an Apollo asteroid with a comet-like orbit but no cometary activity has been discovered. • The brightness of Nova Sgr 2008 is already way down again, at 8-9 mag. yesterday. • Details on how NASA s/c image the Earth at night with all its light. It was the night of Oct. 23, 2007 (UTC) when something - still largely unexplained, it seems from the lack of substantial papers - dramatic happened to comet 17P/Holmes. Six months later the comet is exceedingly hard to see visually, though photographers can still be lucky. And in May the comet will come close to several open star clusters in Auriga: perfect opportunities for some fare-well shots! And then there is the suspicion of a 45-day periodicity of (minor) outburts: Yesterday's TA EC #2442 reminds us that "[t]hree such 'mini-outbursts' have occurred so far and, if strictly periodic, the fourth one is expected around April 25. Observers equipped with telescopes of 0.25-m aperture or larger plus CCD camera are strongly encouraged to monitor this object [Holmes' near-nucleus region] which is now quite faint - around 17th magnitude in brightness. [...] Take a series of images over a period of 30-60 minutes as soon as the sky is suitably dark after sunset, and whilst the comet is fairly high in the sky." • For an easier target, meanwhile, try C/2007 W1 (Boattini), now at 7½ mag. In other news Mercury is now in the evening sky, easier every day. Here are also the ongoing Saturn storm on Apr. 23, Jupiter in methane with a small scope, notes about Nova Sgr 2008's brightening and a paper on detailled monitoring of Polaris which reveals "an increase in the amplitude by about 30% from 2003-2006" in this classical Cepheid. • Mecca (where some now want the zero meridian to be moved ...) is among the most light-polluted spots on the whole planet - while Kielder Obs. claims to have the darkest skies in the U.K.
Nova erupts in Sagittarius, now risen to 6.5 mag! To celebrate the 100th post of this blog - in 3 months - a nova has erupted in Sgr: at first it had 8.4 mag. but has since risen in brightness, to 6.5 mag. some 24 hours ago (as reported in IAUC # 8937). • Nova Cyg 2008 #2 is much fainter. • A huge prominence on the Sun was filmed by STEREO on April 9. In other news the bright storm on Saturn has become more obvious again and can be imaged with even small telescopes. • The good evening apparition of Mercury is about to begin. • Comet Holmes is now in eruption for 1/2 year! While Boattini could get interesting as well. • Detailed star maps can be downloaded for free. • Be careful with green lasers - they might be banned in Oz! • High-res images of the Earth are now being delivered from Genesis II. • More weird astronomy will be coming to TV. VISTA mirror reaches Paranal: fastest (for a while) sky survey telescope progress! A 4.1-meter diameter primary mirror, a vital part of the world's newest and - at least for a while - fastest survey telescope, VISTA (the Visible and Infrared Survey Telescope for Astronomy) has been delivered to its new mountaintop home at Cerro Paranal, Chile. The mirror will now be coupled with a small camera for initial testing prior to installing the main camera in June: Full scientific operations are due to start early next year. VISTA will survey large areas of the southern sky at near infrared wavelengths (2 to 4 times the wavelength of visible light) to study objects that are not seen easily in optical light. Samples of objects will be followed up in detail with further observations by other telescopes and instruments such as the nearby Very Large Telescope. The mirror had been almost ready for months but was then stuck in Moscow where it was polished. In other news interesting pictures have been published recently: many views of Phobos from Mars Express not seen widely, video clips from STEREO with CMEs and a comet - and a possible head-on bolide (other explanations haven't been ruled out, though). • Nova Cygni 2008 #2 has already fallen to about 9.5 mag. - but there are still three novae in the morning sky right now. • The 2nd new-cycle Active Region on the Sun got a number (990) after all but there is no spot there anymore in the visible. • This blogger will be in France the next 10 days and updates may be difficult: Thus here are already French and Russian calculations of possible Pi-Puppid activity on Apr. 22 and a preview of a nice Mercury evening show starting in late April on the N hemisphere. First the story appeared on April 4 in Germany's 'leading' tabloid ("I have calculated the end of the world ... and NASA says, I'm right"), later in more serious papers ("Nico and the end of the world") - and today, thanks apparently to an AFP story where the writer hadn't found it necessary to check anything, it has taken off around the world. Alas: it's absolute nonsense! The claim is that a 13-year old German schoolboy "discovered" - while working on an entry for a major German science competition - that the 2036 impact probability of asteroid Apophis is not 1:45,000 as the NASA calculation says but actually 100 times higher. Because during the 2029 approach the asteroid would hit a geostationary satellite and be deflected into a much more dangerous orbit. The newspapers also claimed that this boy not only was awarded several prizes for his paper but that NASA had "conceded" that he got it right and they were wrong. We're all doomed, right? Well, here's what NASA's NEO guru Don Yeomans told this blog yesterday: "We have not corresponded with this young man and this story is absurd, a hoax or both. During its 2029 Earth close approach, Apophis will approach the Earth to about 38,900 km, well inside the geosynchronous distance at 42,240 km. However, the asteroid will cross the equatorial belt at a distance of 51,000 km - well outside the geosynchronous distance. Since the uncertainty on Apophis' position during the Earth close approach is about 1500 km, Apophis cannot approach an Earth satellite. Apophis will not cross the moon's orbital plane at the Moon's orbital distance so it cannot approach the moon either." And here's how one of the German scientists mentioned in the first story, celestial dynamics expert Frank Spahn from Potsdam University, explained events to this blog today: "I indeed had contact with this engaged boy - he asked me which perturbations/forces determine Apophis' orbit and especially during the close flybys. You know that I deal with kinetic theory & celestial mech. in the context of planetary rings, preplanetary disks etc. I explained him the 3 and 4 body problem and gravitational interactions in general. He did not tell me about his idea to consider a collision. This was in January or February. The next time when I heard of him was in in the boulevard journaillie "Bild" - together with my name. I asked him to meet me (last Friday), he told me about the asteroid - satellite collision thing (after I asked him how he calculated and "corrected" the NASA result). Then I showed him at the black board about the extremely small collision probability (frequency) with such an object. Seeing the arising problems I attended the set of [German TV news station] N24 and explained the leading responsible person that I appreciate the engagement of that young student but simultaneously I express that one has to mention the low probability of such a collision plus expressing that this is not a correction to NASA. The filming session went on and I had to leave for another meeting. The I saw yesterday that nonsens in TV - and I am shocked. By the way - I haven't seen that paper and the work sofar, Nico told me that his computer disk had a virus so that only hard copies are available which are with the referees of the contest at the moment. So - I do not know how he could have won the competition, obviously the referees were no experts." Finally it's official: Cassini's mission extended for at least two years! In other news GRB 080319B has provided the best-ever afterglow spectrum of all gamma-ray bursts. • Here are images of SN 2008ax in NGC 4490 and Nova Cyg 2008 #2 which is currently at 8th mag. • Without ever getting an AR number, a tiny sunspot from the 24th cycle has disappeared today. 7th magnitude: another nova in Cygnus! "Koichi Nishiyama, Japan and Fujio Kabashima, also of Japan report discovery of a possible nova (mag 7.7) on two 20-s unfiltered CCD frames (limiting mag about 12.5) taken on 2008 Apr.10.728 UT using a 105-mm-f.l. f/5.6 camera lens," reports The Astronomer Electronic Circular #2438 this morning: "A precise position has been obtained: RA 19h 43m 01.96s DEC +32 19' 13.8" (2000) On April 10.78UT the magnitude was 7.7 (unfiltered)." There is also an "independent discovery at mag approximately 8.0 by Z.-w. Jin and X. Gao on several 60-s survey images (limiting mag about 15.0) taken by Gao on Apr.10.831 with a Canon EOS-350D camera (+ 7-cm-aperture, 200-mm-f.l.f/2.8 lens) at Xingming Observatory, Mt. Nanshan, with Beize measuring position end figures 02s.00, 10".1 for the variable". And so we file yet another nova discovery by amateurs! A red star of 18th magnitude seen on historical images as well as an X-ray source could be the precursor of Nova Cygni 2008 #2 which has already been given the final designation V2491 Cyg. In other news the 2nd sunspot of the 24th cycle may be forming. • The total solar eclipse of 1925 filmed from an airship! (Here's the YouTube video stand-alone). • The Moon will occult M 44 (the Beehive cluster) on April 13 for Europe. • A deep image of Orion, another one and a deep LMC image. • Observing giant planets in the methane band - now amateurs do that, too! • Restarting the "Pluto debate" is a bad idea - the arguments for its reclassification in 2006 were sound. • Another cool ISS image of Apr. 7 (also discussed here). • A new satellite crash predictor for your site. • Two Iridium flare light curves. • And, after a celebrated river journey, the Buran prototype has reached its final destination today; the story even went international. With luck observers in the U.K., Denmark, Sweden and a long track eastwards can see a 4.8 mag. star blink out for 1.7 seconds at most when asteroid (1886) Lowell occults HIP 63355 on the evening of April 11th - a rather rare event that's being advertised in the U.K. And if it doesn't work out there is always Yuri's Night on April 12 that will be celebrated heavily around the world. In other news there is a new comet with perihelion next year, but it will stay dim. 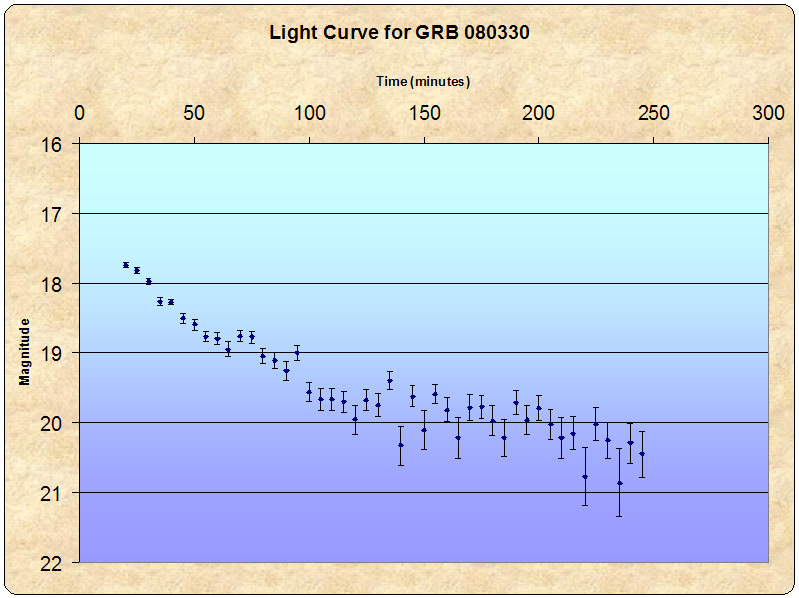 • The afterglow of GRB 080319B is fading slowly (but very faint anyway). • Some fun - and not so fun - thoughts about laser pointers and the sky: Especially the extremely bright green ones so popular among (some) astronomy educators are a real hazard to aviation and can get you in deep trouble with the law. • And finally two astronomical "news stories" making some headlines right now aren't news at all - they are based on papers from January and February: The "smallest exoplanet" story (from this press release and wire stories) comes from this paper which had been discussed in this blog in February, and the "coldest Brown Dwarf" (from this press release) is based on this paper (so the embargo of the PR doesn't make sense). In other news here are images of the crescent Moon 1 1/2 days old on the 7th (more images) and 2 1/2 days old; other images from the 8th include the Plejades: The farther west the images were taken, the closer the Moon came to the cluster. • A very different moon in striking color and detail: Here is how the MRO sees Phobos, one of the two little ones of Mars! They are called Télescopes à Action Rapide pour les Objets Transitoires or simply TAROT, and the purpose of the two 25-cm telescopes in France and Chile is to measure the early optical counterparts of gamma-ray bursts - but these remotely controled telescopes can also be used for other purposes. The one at the Observatoire de la Côte d'Azur, for example, has been observing stars with asteroids approaching for several years, just hoping for a hit - and now this TAROT has provided, once more, a nice chord from this interrupted star trail from a star occultation by (695) Bella on April 1st. Comes a space shuttle passing by ... on the river Rhine! Well, it's not one of the shuttles but a Soviet Buran and it's also not the one that performed the only spaceflight of the ill-fated program 20 years ago - but one of the surviving prototypes, the No. 002 alias OK-GLI used in 34 taxi, approach and landing tests and later ending up in Bahrain's harbor. Having already made it to the Netherlands, on Monday it should start a journey up the Rhine river to its final destination, the Technik-Museum Speyer in Germany: While this semi-Buran is partially disassembled, as recent pictures show, it will at least be a strange sight (there is even a photo contest). Via a GPS receiver the convoy's position can be tracked in real time; due to motor problems of the vessel it's stuck in the Netherlands, though, for tonight, and may hopefully make it to Krefeld, Germany, on Monday. 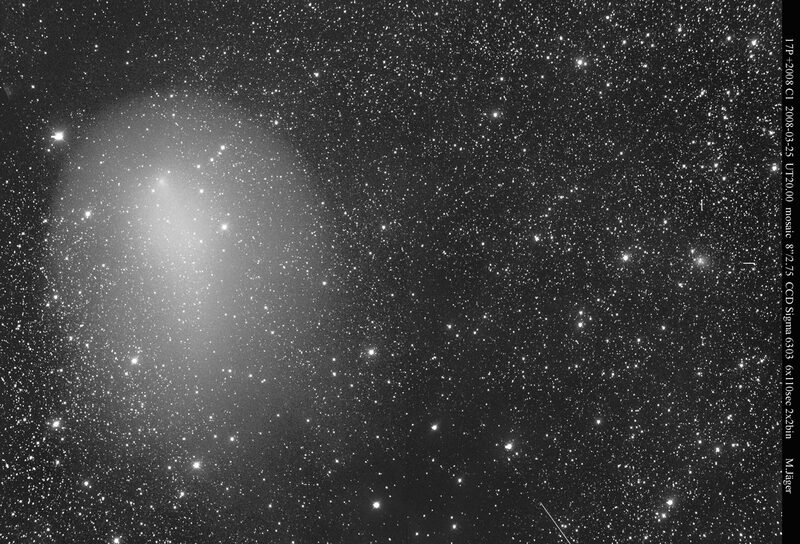 In other news comet C/2007 W1 (Boattini) - seen here in pictures of today and April 4 - is indeed brighter than expected: It was estimated at 8.9 mag. on Apr. 3 and at 8.6 mag. today (and 26P/Grigg-Skjellerup is also brighter than thought). 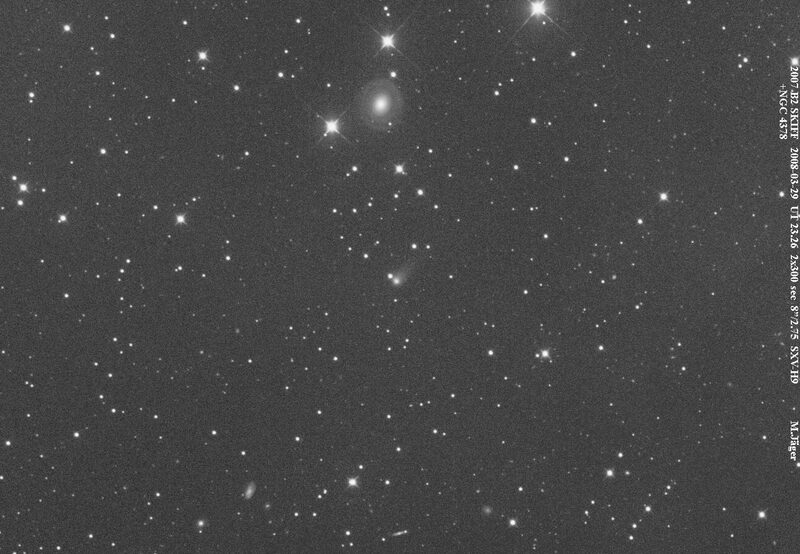 • Comets in conjunction: C/2007 B2 (Skiff) with some galaxies today and another one on Mar. 29, and Chen-Gao next to Holmes on Mar. 25. • The Moon near Venus and hard-to-find Mercury on Apr. 5 and Mercury at Venus on Mar. 26, as seen from Oz. • Finally a map of Mars in 2007/8, based on images by one amateur. Did Venus Express "smell" signs of active Venus volcanoes? This issue is also of interest for amateur astronomers for two reasons: active volcanoes and related atmospheric effects could play some role in the - controversial - visual sightings of an "ashen light" on Venus' night side. And with modern CCD cameras amateurs are actually able to join the hunt for volcanoes because right at 1 µm there is one of the windows into the atmosphere that actually permits imaging the surface of Venus where hotspots would stand out. Cameras on the Venus Express orbiter have used this approach ever since orbit insertion, but nothing was seen. Now, however, the same orbiter (well, there is only one right now :-) may have "smelled" active volcanoes by detecting "a highly variable quantity of the volcanic gas sulphur dioxide in the atmosphere of Venus. Scientists must now decide whether this is evidence for active volcanoes on Venus, or linked to a hitherto unknown mechanism affecting the upper atmosphere." In other news an even better image of the ISS & the ATV hours after docking has been published, one should (in the Northern hemisphere) be on the watch-out for crescent Moons on the evenings of Apr. 6 (this will be very tough, esp. in Europe where the Moon will be a mere 14 hours old), 7 and 8, and there will be an attempt to reach the umbral zone of the August 1 total solar eclipse on Devon Island by making it through the Northwest Passage in a small sailing vessel. This time it was no sensation like GRB 080319B, but the gamma-ray burst on March 30 was interesting for another reason: an amateur-run observatory followed the decaying afterglow (here's a movie - big file!) of the burst with high time resolution. In other news an amateur with a small scope has succeeded in detecting the parallax, proper motion and orbit of 61 Cygni, the famous star for which Bessel measured the first-ever stellar parallax. • A planet-hunting telescope had accidentally recorded the beginning outburst of Holmes (note: the date given in the release is one day late) almost from the beginning. While 22P/Kopff may be undergoing an outburst right now and C/2007 W1 (Boattini) is brightening faster than expected. • Atmospherical science from airplanes bring two recent cases: a dramatic polarization effect and a real mystery. Soon after the ATV docked to the ISS, an amateur already caught the station with its attachment with high resolution. While the two were still separate, another group had caught the ATV itself with some detail. • From the NAM in Belfast not only several bloggers blog like crazy (including twitter reports like this rather funny one), the ROG also has stories (one more). • And here are HCM-7 reports of days 2, 3 and 4. April 5: The waning crescent Moon is close to Venus und Mercury, something best (only?) seen from the Southern hemisphere. April 8: The waxing crescent Moon (only 12% illuminated) scratches by the Plejades and won't drown them in light - photographers be aware! April 13: The Moon occults the Beehive star cluster (M 44) around 19:00 UTC. April 15: Regulus, Saturn & the Moon form an evening chain. Around April 27: The best evening apparition of Mercury (for the Northern hemisphere) begins, lasting until about May 19. In other news the three March sunspot groups from the old cycle could still be seen in white light and H-Alpha yesterday, but AR 989 has now faded away. • Here is the sky during a total lunar eclipse, the one of Aug. 2007 when a lot of Milky Way came out. • Tethys emerging from Saturn's shadow has been observed, • With 15 discoveries, SuperWASP is now the most successful transit planet hunting 'machine'. • A rare case of a prominent astronomer blogging - if only once a week: Mike Brown. • And here's your chance to "participate" remotely at two conferences, the NAM in Belfast and the HCM7 in Salzburg from where a participant blogs in German.